Isn’t this the most beatiful – and yet still functional – polytunnels you’ve ever seen? I can only imagine the back-breaking work that it must have been to get the paving and raised beds to look so good. It’s certainly given me something to aspire to, although at 24’x49′ they have had a little more space to play with than we will in our “baby” 14’x28′ tunnel. This wonderful construction is on Locks Park Farm in Devon, and you can see the saga of its creation here. I wonder what ours will look like when it’s done? Really getting into my planting list now. As mentioned in my previous Planting List post I’ve been looking at what we eat, and comparing that with the list of tried-and-tested plants for aquaponics systems over at Backyard Aquaponics. Been going through the Garden Organic Catalogue to get an idea of the range of varieties and their planting times etc. I then combined that with expected yield information from my well-thumbed copy of John Jeavons’ “How to grow more vegetables”. and current pricing info from Sainsbury’s. This gives me a good idea of how much we can expect of each plant and what it’ll be worth to us. It’ll be interesting to see which plants meet or exceed these yields, as they are specifically derived from soil-based techniques. This is really our first-year test list, so I’ve deliberately gone for a broad range of varieties. Once we start to see which varieties do best I’ll start to reduce the range a little, although I’m very keen to try and keep a diversity of crops to minimise the impact of any particular failures or diseases. OK, here’s the latest iteration of our Aquaponic System. I’ve managed to squeeze another two small growbeds in, and have added the pipes to help show how it works . I’ve mainly been working on the planting list to see how well it’s going to do at feeding us all, and from that I’ve realised that some seedling-prep areas will be required, you can see these lattice-style designs at the right-hand end, designed to be a great spot for sowing and storing seedling prior to planting out in the beds. 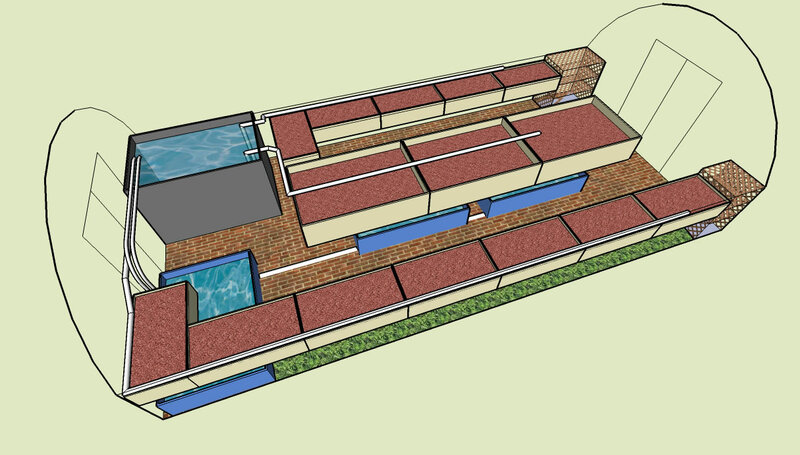 I’ve even added a small non-aquaponic bed under the south-facing row of growbeds – shown here in green. I’m going to try peanuts in there as they should like the temperature and they are just the right height to fit under the growbeds. It’ll be an interesting experiment!